A feature-length version of the rare World War I-era silent serial about German saboteurs stealing a secret formula. Alice Grayson's inventor uncle is murdered, and his blueprints for a wireless torpedo are stolen by criminals who plan to sell them to America's enemies. The brave young woman and her intrepid boyfriend, engineer Bob Moore, now must recover the plans before they can seal America's defeat in World War I! Of the many adventure serials released during the silent era, Wolves of Kultur counts among the rarest. Filmed at the height of World War I, director Joseph Golden generously sprinkled anti-German sentiment into the chapterplay's storyline, most likely to receive publicity from the Committee of National Defense. The first chapter of Wolves of Kultur wouldn't premiere until October 20, 1918, however – only three weeks before the end of the war! With Americans now more interested in reconciliation, a weekly serial with titles like "The Hun's Hell Trap" was no longer of interest. 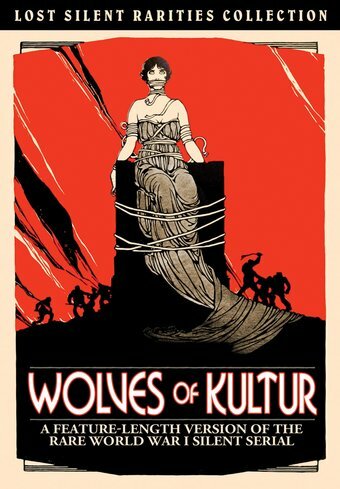 To make matters worse, an influenza pandemic forced many movie theaters to temporarily close just as Wolves of Kultur was beginning its fifteen-week run. All this meant that very few people saw Wolves of Kultur when it was originally released. This is unfortunate for serial aficionados, as it boasts some of the most spectacular stunt work of its time, with attractive leads Leah Baird and Charles Hutchinson leaping from speeding horses, autos, trains, motorboats and towering cliffs. The most exciting scenes are compiled into this feature-length film version, never before on DVD! Note: Due to the age and rarity of this film, picture anomalies exist.